345 of 365: Red Hot, originally uploaded by Lady Pandacat von Nopants. What could possibly be more spooky and appropriate for Halloween than licorice? Both the candy, aroma and Black Licorice perfume, which incorporates sweet notes of rockrose, honey and rose with licorice-drenched star anise, coconutty tarragon absolute and a hint of patchouli. However, Licorice flavour is not limited to the candy and root alone. The aroma actually exists in aniseed, licorice root, star anise, fennel seeds, leaves and bulb, and herbs such as tarragon and some varieties of basil. Indigo has violet and anise, an unusual combination that has become somewhat of a classic since the legendary l'Heure Bleue, and is even paired in violet-anise pastilles, but also caraway seeds, which have an air of mystery about them and are used in breads and harvest seed cakes (I even used them in my Madeleine seed cakes), and also tarragon, which has a greener anise note to it. Vetiver Racinettes also has tarragon, which gives the earthy, dry roots of vetiver a rootbeer-like sweetness. These aromas of herbs and seeds can all be incorporated into delicious foods during the fall for a warming, savoury-sweet effect. Like I said - licorice is not all about candy! Mixed together the cream cheese, grated orange zest and chopped tarragon leaves. Sprinkle with one even and thin layer of fennel slices. Close two slices together and trim away the crusts. Pop by for a visit to find out which perfumes are there (they are in no other boutique!!!). And while there, enjoy wonderful selection of locally designed jewelry and accessories and carefully selected wardrobe essential in this compact, intimate boutique that is off the beaten track (aka Robson st. and all the malls). And the service there is impeccable. I will also be there in person on Tuesday, December 7th for their holiday soiree, 2-9pm, to open the holiday shopping season when the store will be open 7 days a week. We will be serving wine, cheese and... why, truffles, of course! Fragrant Reviews is a blog that publishes 40-characters (or less) reviews of perfumes on a daily basis. This is, by far, the shortest and sweetest review that I ever got for any of my perfumes. You're invited to read my last edition for News from the Nose: Autumn Aromas & Fall Fragrances. If you haven't signed up to AyalaMoriel's mailing list than now is a good time to do so! My newsletters bring inspirational ideas for enjoying each season's through the olfactory and sensory world - including interesting olfactory stories and traditions, original recipes etc. And also will inform you of special promotions, sales and new perfumes and products! 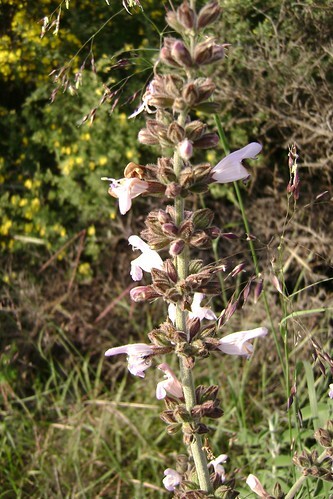 Flowering Sage, originally uploaded by Ayala Moriel. Climbing up the mountain called "Abaya" fills your lungs with clean, dry air that is redolent of oak leaves, arbutus berries, and the stronger and more prominent presence of sage, labdanum and hyssop bushes that rub against your legs with every step. In different seasons, the intensity of those odours varies. In the winter, the musty and refreshing scent of wet soil and newly wild weeds make the air feel clean and pure. Rockroses usually bloom in the winter, but their scent is nothing to write home about (there was none last time I checked). In the spring, the sage blooms, as well as thorny bushes from the broom family, that fill the air with an intoxicating yellow aroma of wild flowers and honey. This makes for quite an intoxicating hike up the mountain trails and possibly induce a headache or a trail of sneezing: the air is over-saturated with yellow pollen (you can see these in the blurry background of the blooming sage photo above). 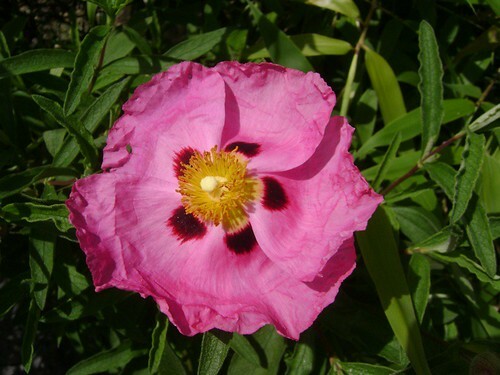 Rockrose Pink, originally uploaded by Ayala Moriel. 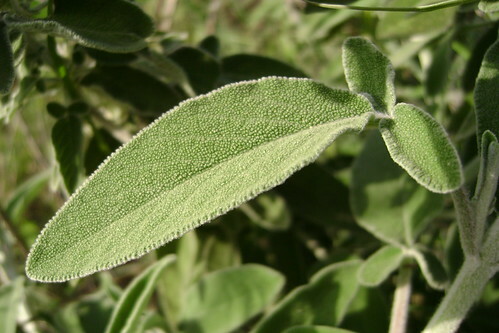 Sage Leaf, originally uploaded by Ayala Moriel. This is just an experience you associate with the mountains and hills of the Mediterranean, but does not have a name in our language whatsoever. But as it turns out, there is a name for it in French (this language is particularly descriptive and precise when it comes to the senses). And so, the 6th part of our Aromas of Autumn Series is dedicated to Garrigue, a term that is new to me. I became aware of it thanks to one of my customers and SmellyBlog readers known as odysseusm. Zaatar, originally uploaded by Ayala Moriel. 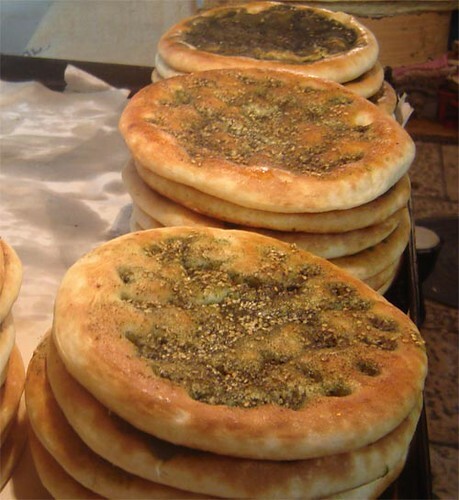 In our region, we eat, drink and breathe garrigue... For example: the za'atar bread is a flat bread similar to pita or cheese-less pizza, that is covered with a mixture of wild hyssop, thyme, sesame and sumac mixed in olive oil. Garrigue is resinous, warm, earthy spicy aroma, herbaceous in part, and I suspect greatly impacted by the presence of cistus or rockrose on the mountains. Garrigue perfumes are those who got a prominent cistus and herbal presence - such as Song of Songs, Ayalitta and Autumn. The latter two are Chypres and both with sage. The first one is an oriental, but with so much labdanum that once applied to the skin, and especially the anointing body oil - makes my entire being smell of sunbaked mountainous rocks and roses. Garrigue wines are redolent of baked earth and warm herbs and are full-bodied and aromatic. So it is only fitting that the winery in my village is called Abaya Winery. Winemaker and founder Yossi Yodfat explained garrigue to me as "a combination of thyme, sage, "kida" (these are the broom-related bushes mentioned earlier), "ela" (mastic), and some difrent kinds of grass. The scent changes with the season, and its more green and fresh in the winter, more herbal in the spring, and more dry, and sharp (like dry grass) in the summer". 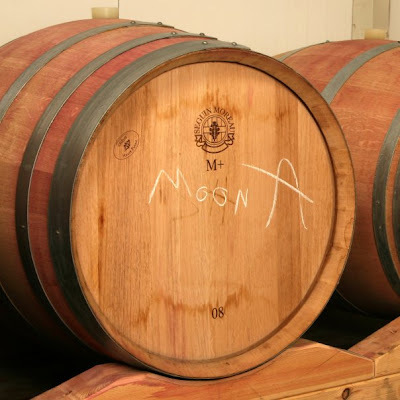 Abaya Winery uses only grapes grown in the region and are suitable for the drought conditions, warmer and shorter winters, lower elevation and close priximity to the sea. 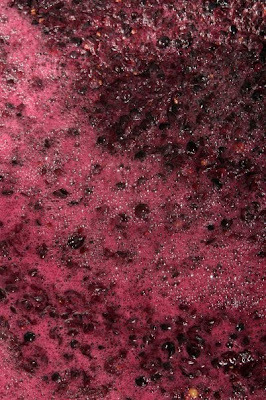 They use grapes such as Sirra and Carignan. Yossi himself is a lighting designer and involved in the art community. So the space, built just next to a Medieval fortress (Mivtzar Yechiam) is used beyond winery functions - it is also an art and culture centre, and they promote emerging artists. For example: a young visual artist, Noam Dehan was commissioned to design the wine labels. Each vintage has a new set of labels. 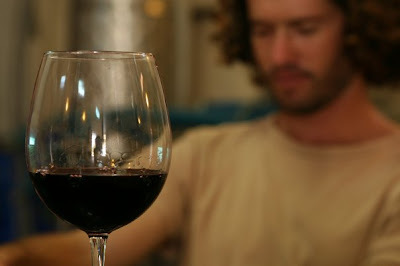 Abaya's wines are red, strong and full of character. Moon-A 2008 is squeezed from Sirra, Cabarnet Sovignon and Petit Verdot grapes, aged 12 months in French oak barrels to produce a soft body, balanced acidity, and pronounced yet not overpowering woody presence and an even diffusion on the palate. Le Rouge 2008 is made from Cabarnet Sovignon, Carignan and Petit Verdot grapes, and is also aged for 12 months in French oak barrels. This wine has a burgundy colour, a stable body, high but not exaggerated acidity, and a non-overpowering woodsiness. It is an elegant wine that is very suitable for accompanying meals. Midsummer's Eve 2007 combines Carignan and Sirra grapes with a little bit of Cabarnet Sovignon. "It reminds me that summer scent of dry grass and summer fruits", Yossi explains how he picked the name for this limited edition wine (there are just a few bottles left). It's a massive, thick wine with deep, nearly opaque burgundy hue. It has the sweet aroma of ripe fruit, roasted coffee and earth. Rich and with a hint of spicy clove. It is warming like a midsummer's eve. 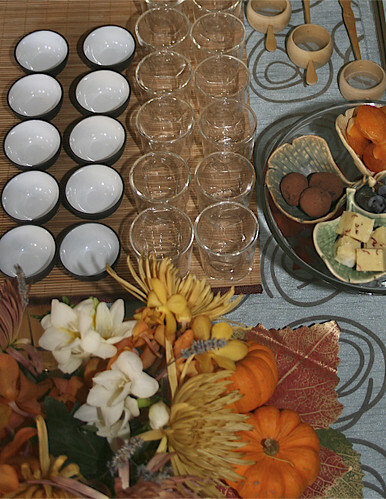 Gifted portrait photographer Shawn Nygren has kindly documented the Fall Harvest Tea Party. Here are her photographs, to give you all a sense of the atmosphere and what was happening during the preparation, the party and the tea tasting. Setting out the tea tray, originally uploaded by Ayala Moriel. Tea tray, before the guests arrived!, originally uploaded by Ayala Moriel. 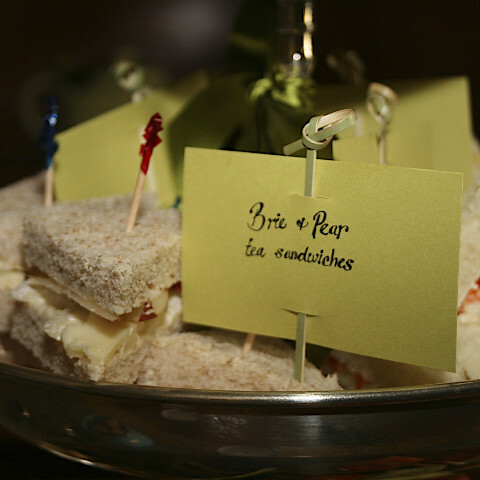 Brie + Pear Tea Sandwiches, originally uploaded by Ayala Moriel. Seedcake Madeleienes, originally uploaded by Ayala Moriel. 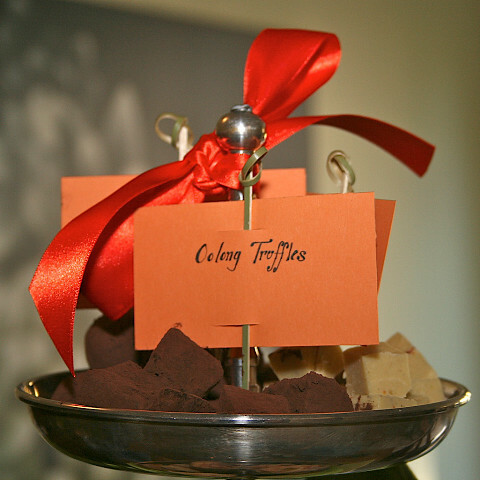 Oolong Truffles, originally uploaded by Ayala Moriel. 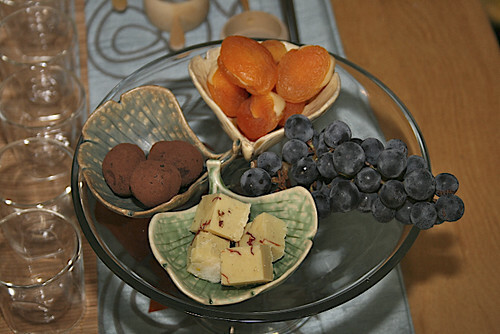 Fragrant Fall Harvest Desserts (clockwise): Apricot + Marzipan Petitfours, Coronation Grapes, Saffron-Osmathus White Chocolate Truffles, Espionage Truffles, originally uploaded by Ayala Moriel. Tea Tasting & Flower Arrangements, originally uploaded by Ayala Moriel. 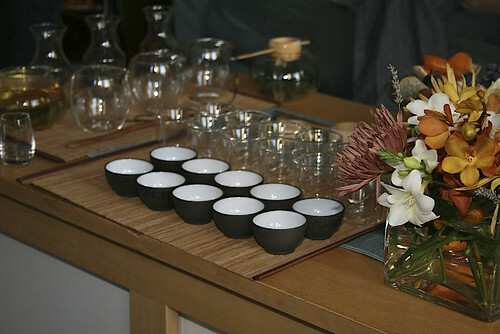 Tea tasting set up, originally uploaded by Ayala Moriel. Pedro's tea demo - brewing Suk (wild artemisia), originally uploaded by Ayala Moriel. 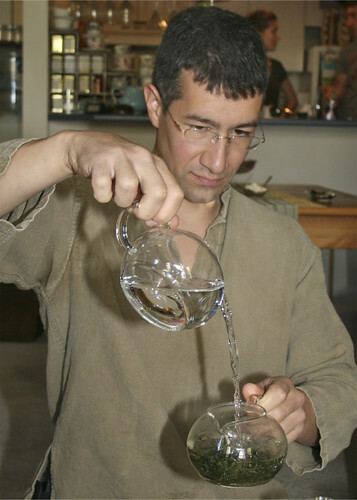 Pouring strained tea, originally uploaded by Ayala Moriel. 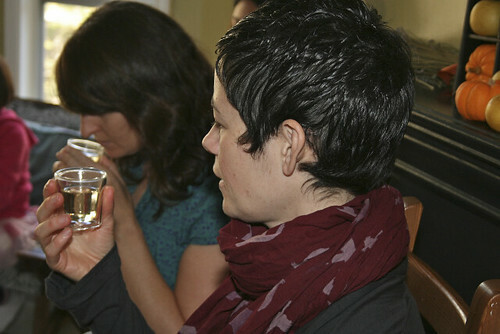 Tea tasting (Rachel & Lauren), originally uploaded by Ayala Moriel. 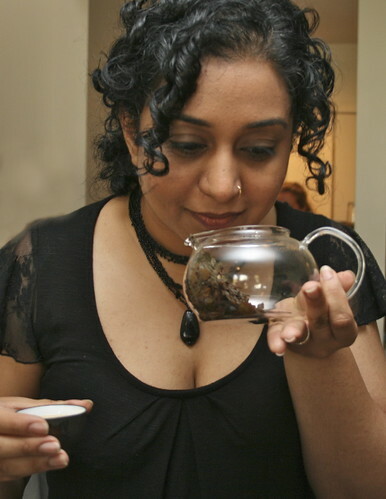 Ramneet smelling brewed Sejak (Korean green tea) leaves, originally uploaded by Ayala Moriel. Tea tasting - Pedro, Naomi, Kath & Cassandra, originally uploaded by Ayala Moriel. 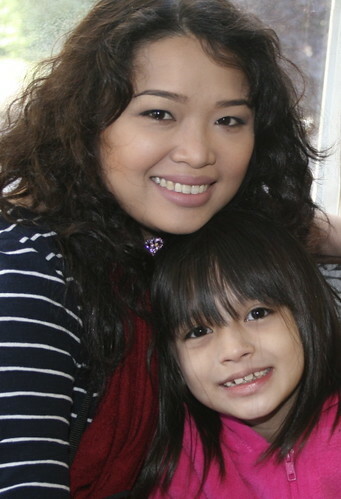 Mary & her daughter, originally uploaded by Ayala Moriel. 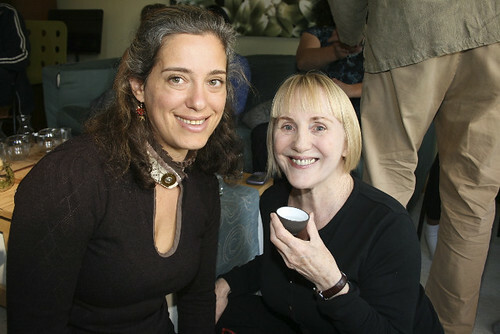 Jami & Ann, originally uploaded by Ayala Moriel. 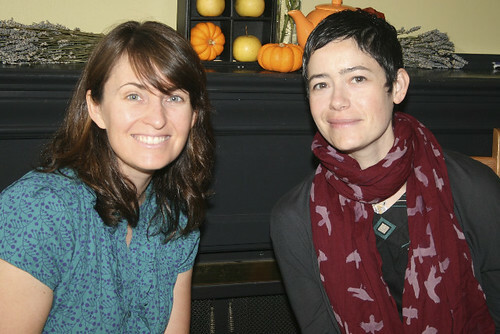 Rachel & Lauren, originally uploaded by Ayala Moriel. Kath & Naomi, originally uploaded by Ayala Moriel. 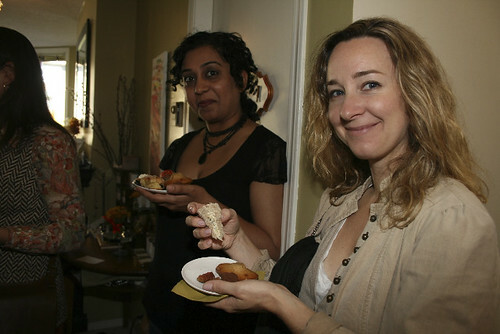 Ramneet & Heather , originally uploaded by Ayala Moriel. Melinda & Ayala, originally uploaded by Ayala Moriel. 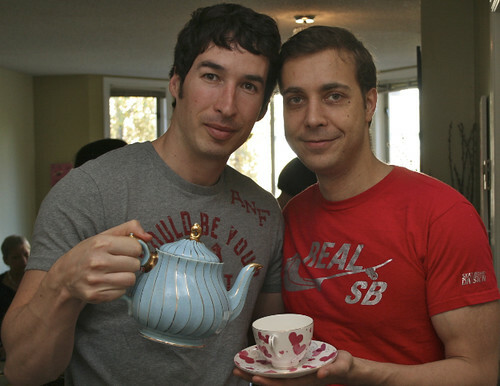 Yaniv + Yaniv = boys love tea too!, originally uploaded by Ayala Moriel. For more stories from Pedro's travels and the tea masters and farmers he works with visit his blog. Tea Master Zhan Zimei and her husband - making Wild Chrysanthemum tea (this is so far my personal favourite from Dao Tea). We served this tea chilled with spearmint at my Midsummer Tea Party. 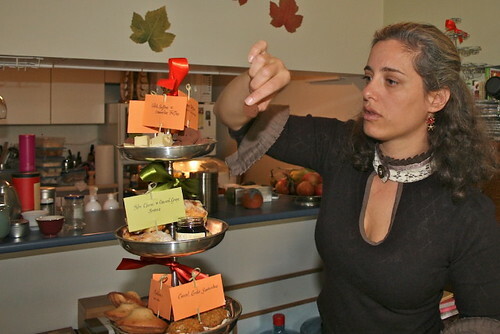 Taste & Sip Magazine Covers Fall Harvest Tea Party! 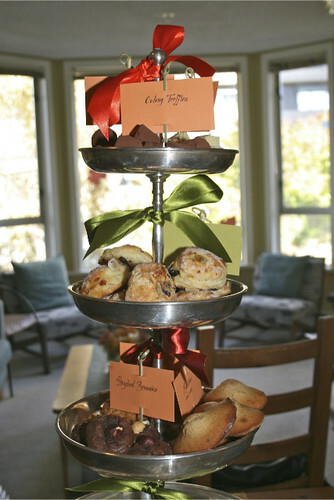 Read Taste & Sip Magazine's coverage of my 5th tea party this year - Fall Harvest Tea Party! 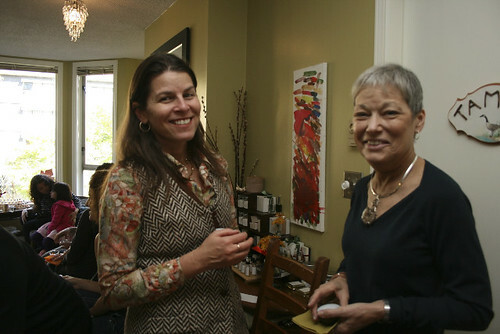 Written by Richard Wolak, who is also the senior editor for Vancouver Foodster. The lovely leaf doilies were generously donated by my student and intern Monique. Fruit & Flower Fall Display by Brenna, also known as the altar of offering to Martha Stewart and all other home goddesses thereof! Raffle tickets... The prize was a gift bag with Lavender Bath Salts, Dao Tea Sejak (green tea), and Charisma perfume mini, which went to leaf no. 11 - held by the lucky Melinda! The full menu included some classic favourites from my tea parties (I think after doing these tea parties for a year and a half I have formed my own "classics"...), and a few experimental ones - such as a the new truffle flavours infused with oolong tea or with saffron and osmanthus tea (shaped as squares, by the way). Everything was planned with harvest in mind - pumpkins, squashes, carrots, corn, seedcakes... 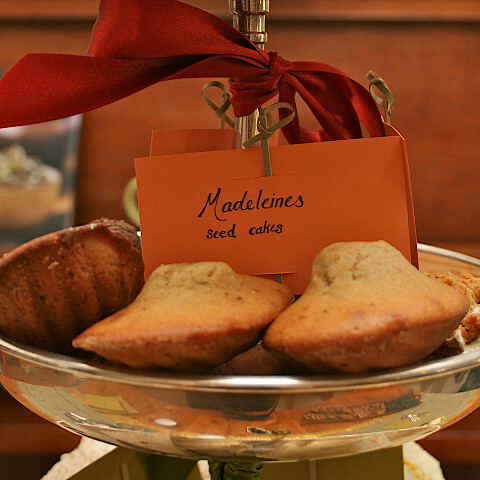 The seedcake madeleiens (which just looked like any other madeleine) were spiked with cinnamon, cloves and caraway seeds. This is an interesting marriage between the English seedcake, which was traditionally used in harvest celebrations, and the dainty little French cakes (awesome for dunking in spicy chai tea the next day when they turn stale!). Gianduja Brownies - these are packed with fresh, organic and local hazelnuts, and are dairy and gluten free! The heart of the event was Pedro's tea tasting and demonstration - he brewed a wild suk (artemisia) - an herbal tea from Korea, from shade-grown and very youngn leaves; Sejak green tea from China, and Balyhocha (yellow tea oolong) from two different farmers in Korea - Kim shin ho, and Kim jong yeol. Pedro is an unusual tea curator and importer that traveled through the mountains of China and Korea to connect with small independent tea farmers. These farm-to-table connoisseur teas tell the stories of the soil they were grown in and the hands that harvested them. 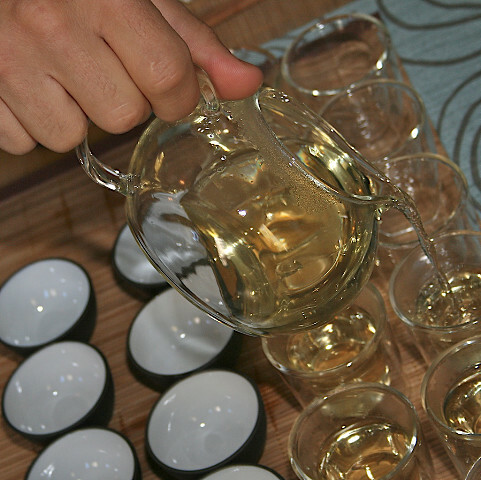 More about each tea on Dao Tea website. And last but not least - my own presentation, featuring three scents for times of transition, and giving some advice about how to pick a scent for fall. I passed around scent strips and roll-on bottles of Moon Breath (in honour of Artemis, the goddess of the moon, and to reflect the tea menu which included artemisia tisane). This is a perfume I originally created for the moon breath meditation - a type of breathing that involves breathing with the left nostril only, while covering the right one with your right index finger. It has soothing notes of amber, incense and eurphoric jasmine - all associated with the moon. I originally had it as a meditation and anointing oil for the candles I burnt during meditation. I find meditation to be very helpful in transitional times - which tend to be very stressful (especially now with market season approaching!). And last but not least - a not-yet-released perfume which I have been blogging about its creation for a while here - my ginger & amber perfume, in its 6th and final mod. This is very cozy, bracing hot and cold at the same time. The amber makes it feel like a warm fuzzy cashmere sweather. The ginger has both heat and coolness to it, and the orange is very juicy - it's with orange juice essence, rather than just using the peel. More about that scent at another time though!